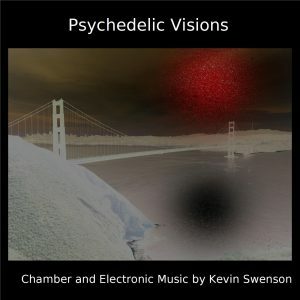 I am pleased to announce the release of my first official album, Psychedelic Visions. 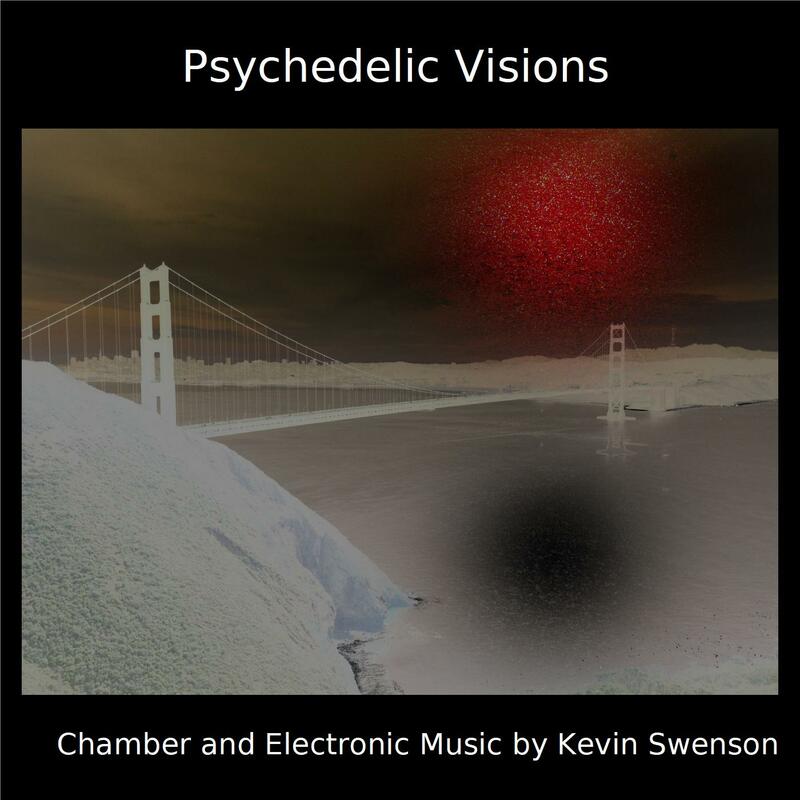 Featuring many of my most recent works including Visions for Chamber Orchestra and Max/MSP, the album presents a variety of chamber and electronic compositions. The first 3 tracks were recorded in a studio setting at University of the Pacific. 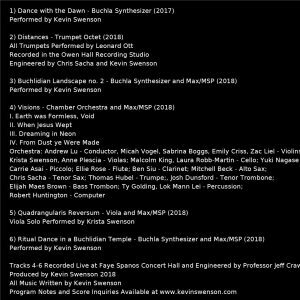 Tracks 4-6 are live recordings of the pieces which were performed at my Senior Undergraduate Recital (in reverse order). You can order the CD on the Score and CD Order page. All of the pieces featured are also available to stream on this site along with program notes, and other information about the piece’s composition and its performers. Scores for any of the instrumental works are available via request as well. See below for the album’s cover and track listing. Merry Christmas! In honor of the 200th anniversary of the writing of the much beloved Christmas carol “Silent Night” I have created an arrangement of the song on the Buchla Synthesizer. To accomplish this I used Logic Pro X to record each individual part in a multi-track project. The noise at the beginning was synthesized using the 266 Source of Uncertainty’s noise generator filtered in sequence using both of the 291’s filter. The arpeggios were made using the 259e Twisted Waveform Generator and the 250 sequencer. The bass part was made using the 259 Complex Waveform Generator’s modulation oscillator filtered at the 291e Triple Morphing Filter using the all input. The melodic and harmonic voices were synthesized using the 259 principal oscillator and the 216 voltage controlled keyboard. The vibrato like effect was made by using the 259’s modulation oscillator as an LFO in the sub-audio range. Its signal output was patched to the FM input on the principal oscillator and only enough voltage was added to the principal oscillator to create a subtle vibrato. The major scale used in the song was tuned using fzero~ in Max/MSP to achieve (rather consonant) just-intonation intervals. Reverb and delays were all processed in Logic. Because this was a multi-track project which used many different variations of one patch I have not provided a picture as on many of my other Buchla pieces. The ratios used for the scale are as follows: 1/1, 9/8, 5/4, 4/3, 5/3, 15/8, 2/1. Visions is a piece of four contrasting, interwoven movements which explore themes of prehistoric chaos and utopic peace, sleepy surreality and real human catastrophe. 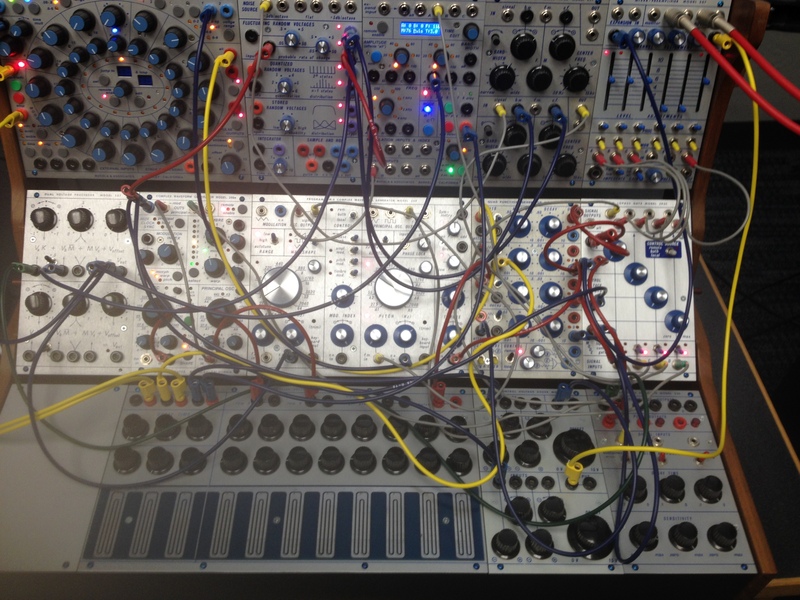 As an element of orchestration, it incorporates a wide variety of electronic sounds ranging from sampled sounds from nature such as birds and water, to penetrating drones crafted on the Buchla Analog Synthesizer, which are performed from a patch in the computer program Max/MSP Each movement occupies its own distinct sound world, and a bridge in the Max patch serves to carry the listener from one to the next. In the first movement the Max patch predominates, gradually unfolding into a collection of natural sounds while the orchestra performs with their instruments “deconstructed.” Beginning in the second movement much of the orchestral material is derived from a cannon by the early American composer William Billings called When Jesus Wept. The cannon serves as a symbol of early mankind, initially sprouting from out of a drone, the most spiritually pure of musical sounds. Though the second movement may be lively, When Jesus Wept both by its name and its austerity foreshadows the darkness of the third movement which drifts through mysterious and quiet material between a couple of more intense textures. Inevitably, the dreaminess of the third movement collapses to a cataclysmic and dissonant fourth movement, completely absent until the end, where the orchestra and Max are finally combined into one collective voice. It is the silver lining of rebirth after the apocalyptic nature of much of the fourth movement Ultimately with this piece, I have attempted to abstract a narrative in which we are all a part – the cycle from Alpha to Omega, beginning and end, creation and destruction. 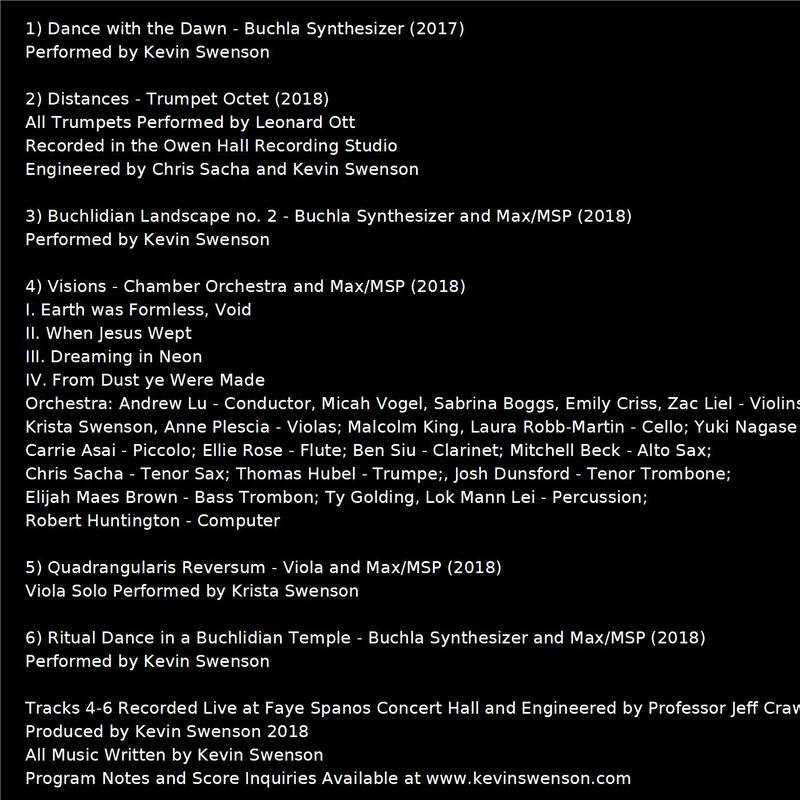 Visions was premiered at my senior composition recital at University of the Pacific on November 28th 2018. The orchestra included 19 players and computer. Almost all of the sounds that were used in the patch were produced by the composer, except for those explicitly stated as having been borrowed. I will list the borrowed sounds and their sources, followed by the sounds which I produced myself. Movement 1: All sounds of birds, bugs and water were recorded using a zoom portable recorder. The opening wind sound was produced by using the zoom recorder while driving a straight shot of road at an average of 60 MPH and then processing the audio in the free program Cecilia – (http://ajaxsoundstudio.com/software/cecilia/) Max’s filter design object is heavily used in this movement, exploiting it’s ability to produce complex Chebeyshev-2 filters with stop-band attenuation. The sounds of animals were arranged in Audacity (https://www.audacityteam.org/). 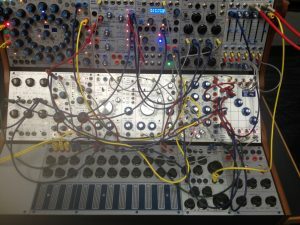 Movement 2: The drone for the second movement was produced on the Buchla analog synthesizer, primarily using the 259 Complex Waveform Generator as well as the 291e Triple Morphing Filter. A second drone is introduced in the middle of the piece which was synthesized on VCV-Rack a free euro-rack emulator – (https://vcvrack.com/). 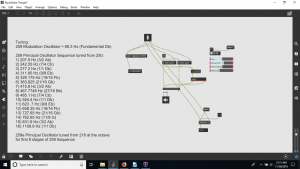 The bass sounds which are most prevalent at the beginning of the dance section were created using the resonators object in Max/Msp available as a free download from the Center for New Music and Audio Technology – (https://cnmat.berkeley.edu/). The sounds of people talking were recorded at a Dead and Company concert in Mountain View, California and at one of the 2018 Pacific Music Camps. The sounds of explosives are fireworks heard on the fourth of July and the sounds of cars were recorded on Pacific Avenue. Movement 3: Throughout the third movement there are chords which are doubled from the strings or woodwinds in Max/Msp using the noise object filtered using the cascade biquad filter. At the end of the movement there is a bridge which begins with a noise sound similar to that used for doubling the strings and winds, except that it was synthesized on the Buchla using the 266 Source of Uncertainty’s noise generator filtered on the 291. The siren sounds were synthesized using the 259 and 259e Waveform Generators timed with 281 Quad Function Generator, and filtered using the 291e. The large explosion sound heard at the end is the same noise source sent to the 291 but with a carefully timed envelope shape from the 281. The explosion is also heard backwards which was made as simple as the click of a button with the warping engine in Ableton Live (https://www.ableton.com/en/). Movement 4: After the explosion at the end of the third movement, the max patch remains silent as the orchestra plays the most dissonant and cataclysmic material in the entire work. 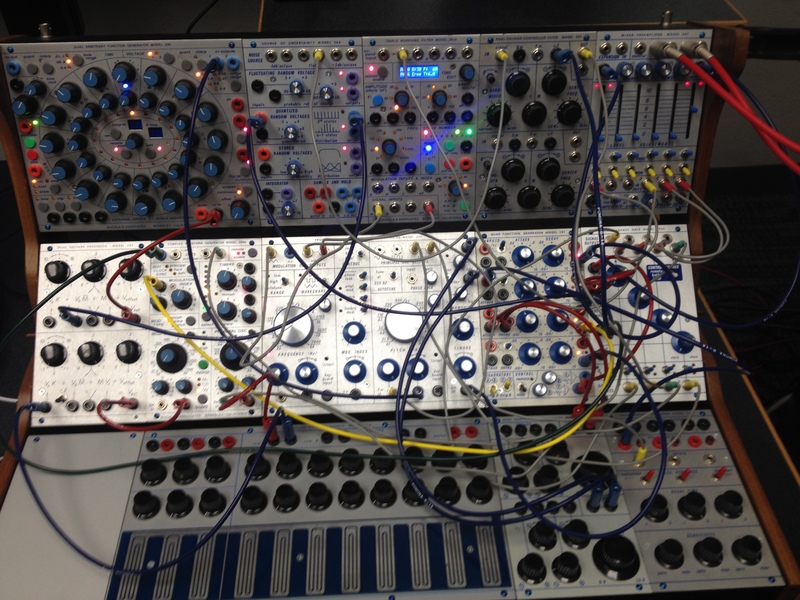 However, in the final section of the movement, a new drone is heard which was synthesized on the Buchla using both the 259 and 259e filtered in a similar way to the drone from the second movement using the 291e. Quadrangularis Reversum is a piece inspired by Harry Partch’s marimba-like instrument of the same name which is a real-time interactive duet between a solo violist and six unique FM synthesis sounds crafted in Max/MSP. The ratios available on Partch’s instrument, situated so that the player can easily play them in sweeping arpeggios, are here rendered as frequencies in the free just-intonation program Scala and stored as a list in a coll object in Max. The chords are first tuned to the C subharmonic series, and then to the F harmonic series. After a meditative introduction, the Viola player chooses to play various notated figures in a semi-random order they wish, triggering different “chords” from the C subharmonic series in Max, each one related to the original arpeggios found on Partch’s instrument. These choices are stored as an independent list and are recalled by Max to trigger the same “chords” retuned to fit into the F harmonic series when the violist exists the stage, and the material which was layered in the beginning returns as if a phantom version of itself. Thus the subtitle What’s Inside the Mirror relates first to the form of the piece, as well as to Partch’s construction of the Quadrangularis which was itself a mirrored version of an older instrument he designed called the Diamond Marimba. It is a mystical piece, which hopes to find the listener reflecting on the present moment, the eternal now – to find a quiet moment with themselves outside of the mad rush of the human world. Quadrangularis was premiered at my senior recital at University of the Pacific on November 28th 2018. Ritual Dance in a Buchlidian Temple is my first fully performable patch on the Buchla system without the aid of additional processes inside of Max/MSP (except for fzero~ for tuning and a bit of reverb). The piece is based on a drone and uses a sequence which is primarily built on the Dorian mode, a scale heard in many religious musics worldwide. It is not notated, but instead improvised on a basic formal structure which is predetermined. It begins slowly and gradually builds into a ritualistic dance. 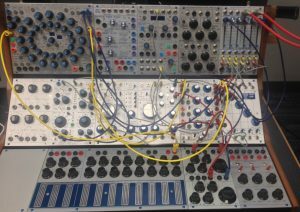 The term Buchlidian is one that I have borrowed from Todd Barton and Dr. Robert Coburn, which is used to describe the sonic realm of Buchla instruments. I performed the premiere of this piece during my senior recital at University of the Pacific on November 28th 2018. A screen shot of the simple Max patch used for tuning and reverb is available at the bottom of the post. Distances for Trumpet Octet is a piece which entertains concepts of distances in various musical ways. Throughout the piece the listener will notice spatial changes within the ensemble, so that parts which compliment one another are sometimes heard close together, and at other times from across the ensemble. Spatial considerations are used to enhance rhythmic figures broken up among the 8 players. Another obvious distance is found in the pitch immaterial of the piece. Distances played a large role in the formation and crafting of the piece itself. For example, when I first began, I charted out all of the possible valve combinations on the trumpet from E4 to C6, numbering them 1-53 (making Eb4 to F#3 0 to -9). I then applied 5 recursive sets of integers to my chart of valve combinations, giving me 5 individual series of notes with specific valve combinations. I assigned one set to each trumpet (set 1 to trumpet 1/5, set 2 to trumpet 2/6 etc.) and leaving set 5 for use among all 8 trumpets. This informed my writing in terms of voicing, and disbursement of alternative fingerings throughout the ensemble – one instance of this is the very beginning of the piece. Ultimately, this is a “trumpetey” piece, which plays off of the tradition of trumpets being used to call across great distances; signaling victory or defeat, a call for help or a dire warning. For many throughout history, who fought in the countless wars of a time long past, the sound of the trumpet foreshadowed whether they were to live or to die. So if this piece seems at times dissonant – perhaps uncomfortably so, ask yourself one question: was it a beautiful sound which brought down the walls of Jericho? 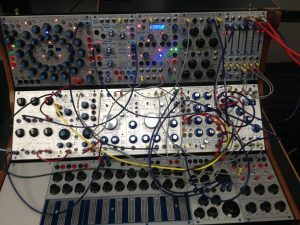 Sketches of Buchlidia is a piece made up of a series of sound fields performed in succession on the Buchla synthesizer. The general elements of each section were preconceived and rehearsed, but the piece’s performance is primarily the product of improvisation. Buchlidia is an adaptation of the word Buchlidian, used here in reference to an alien and imaginary world. Here I will describe the methods used to synthesize each of the sections in the piece. A picture of the patch is provided for reference. The first section begins with a low A triangle wave on the 259’s Modulation oscillator which is triggered by the third pulse output from the 216 keyboard. By turning the second pot on the 257 Voltage Processor which is connected to the second Fluctuating Random Voltage output from the 266 the oscillator begins to randomly change frequency. This audio signal is the then sent to the 291e where the filter frequency and bandwidth are modulated using the same random voltage. This sound is paired with a pseudo-noise synthesized on the 259e with both wave form selectors set to 6 and CV from row B of the tunable portion of the 216 keyboard changing the frequency. The audio signal of 259e modulation oscillator whose frequency is being modulated using row A of the tunable keyboard is sent to the fm input on the principal oscillator. In addition, CV from the modulation oscillator is sent to three places. First it is sent to the 256 Voltage Adder and then used to modulate the attack time of the fourth envelope generator on the 281. Next it is sent to the second row on the 256 to change the spatial position of the 259e principal oscillators sound. Finally, it is sent to the pulse input for the fluctuating random voltage which is being used to modulate the frequency of the 259’s modulation oscillator as well as its filter settings on the 291e. The second section is announced by a droning A on the 259 principal oscillator which is heavily frequency modulated by the 259 modulation oscillator. This is triggered by flipping the trigger switch all the way up on the 281’s second envelope generator. The sound is made “stable” on A by removing the flow of random voltage used in the first section at the 257. The envelope of the 259 drone is also used as CV to attenuate the timbre modulation of the oscillator. The 259e principal oscillator’s wave form selectors are then both switched to setting 2 so that the oscillator’s sound now delivers a definite pitch. The same tuning as before is used from row B of the 216 tunable keyboard, but now the pitches are far more obvious. The scale used is as follows in ascending order: A, D, Eb, E, A, Bb, C, E.
The third section is dominated by the 250 Arbitrary Function Generator. The sequence is set to be a continuous seven stage loop. The 259 principal oscillator, now no longer using fm from the audio signal of the modulation oscillator, is now changing frequency according to CV output one from the sequencer. Pulses at each stage are sent to trigger output from the first envelope generator on the 281 producing the rhythm of the sequence. This means that the 259’s principal oscillator is now double gated as the second envelope generator is still set to continuously cycle. The effect is that the 250’s pulses create a continuous pulse which crescendo’s and decrescendo’s. The audio signal of the 259 is then sent to the first input on the 230 envelope follower (set to transient response) which triggers a noise source from the 266. This noise source is filtered at the 291 and it’s filter frequency and bandwidth are modulated using the first Fluctuating Random Voltage output on the 266 creating an interesting percussive effect. Eventually the 259’s modulation oscillator is switched to low mode and frequency modulation on the principal oscillator is reintroduced. After this, audio from the 259’s modulation oscillator as well as from 259e are triggered freely to fill some of the gaps between cycles of the sequence. The fourth and final section begins with the 259 principal oscillator changing pitch as the result of CV from the 250 sequencer but the sequence is now slowed down by turning the attenuator (receiving CV from the envelope follower) and the voltage offset on the 257 Voltage Processor all the way down. However, the flow of random voltage is reintroduced by turing the second pot on the 257 to the left so that not only is the principal oscillator changing pitch in time with the sequencer, but also being wildly frequency modulated by the audio signal of the 259’s modulation oscillator (still set to low mode) which is itself being frequency modulated by a fluctuating random voltage. Gradually the flow of random voltage is removed and the 259’s principal oscillator begins to once again drone on a very unstable A, going in and out of tune slowly and never really settling. The sensitivity of the envelope follower, which was turned to zero at the for the start of this section so that no noise is allowed to pass through it’s gate at the 292C, is turned up and the pulse response is set to sustained. This section is essentially a inversion of the first in terms of form as it begins with a randomly modulated voltage and ends with a drone. This piece is a meditative drone based composition which features the Buchla analog synthesizer processed in Max/MSP. Individual sounds were layered on top of one another using the record~ object to store sounds in a buffer~. These musical objects were then looped using groove~ to form a psychedelic texture which envelops the listener. Below I will describe the process through which each sound was developed. The first drone to enter on the note G was created using the principal oscillator on the Buchla’s 259 module. This sound was panned hard left and includes timbre modulation on the buchla itself as well as further filtering using the cascade~ object in Max/MSP. The second drone to enter on the note C was created with the modulation oscillator on the Buchla 259. This sound had minimal processing in Max, and instead it’s interest was generated using the Buchla’s 291E triple morphing filter. 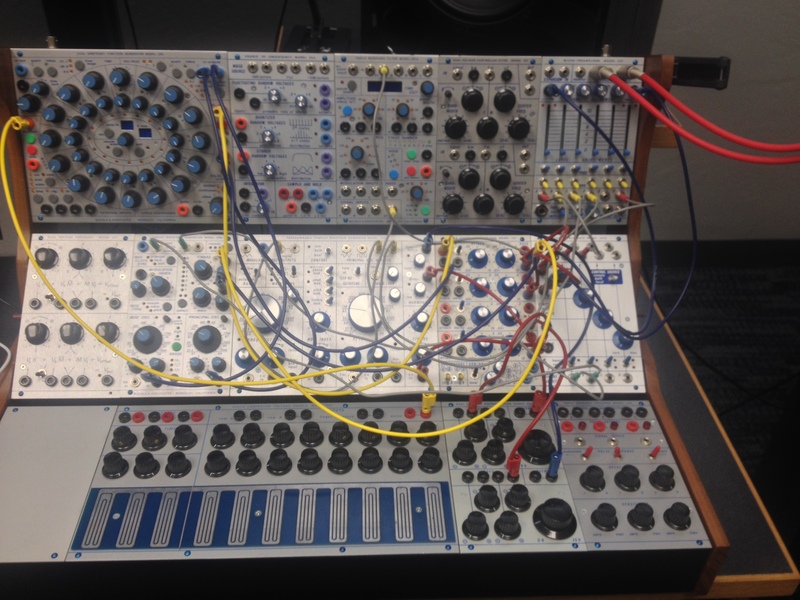 The third and fourth sounds to enter are sequences that were created using the Buchla 259E modules principal and modulation oscillators respectively and tuned to specific intervals from the C harmonic series using the 250 sequencer. Each step in the sequence was triggered using the 216 keyboard pulse function. The two sequences were then delayed in Max using the tapin~ and tapout~ objects, with the random object changing the set delay time so that each iteration of the sequence is different. The fifth and final sound to be recorded into Max was made using the 259’s principal oscillator tuned to the same pitch as the very first drone. 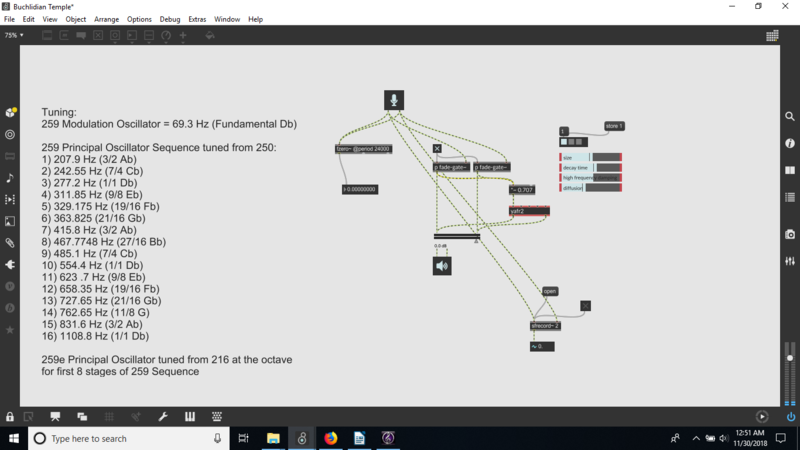 However, the sound was modulated using the the 259 modulation oscillator via the hard-wired modulation switches for pitch and timbre and turning the modulation pot gradually over a period of time fixed by the buffer~ object in Max. Unlike the first sound, this sound was panned hard to both the left and right channels. Although these pieces have already been posted separately I wanted to provide them as a set, for convenience sake. Here you may enjoy the music without the effort of scrolling and clicking. For the curious, I have hyperlinked the title of each piece, taking you to that pieces profile page where you can view program notes and performer information. All of these works were premiered at University of the Pacific’s 2017 Fall Composers Club Concert and recorded live.